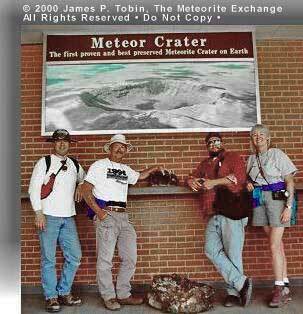 We would like to thank Meteor Crater Enterprises, Inc., for their generosity in letting us explore Meteor Crater. We need to say at this point that this was a special tour. 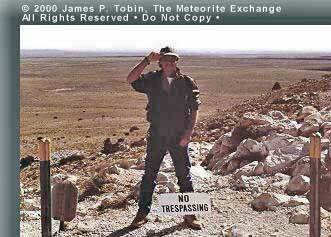 Tours around the rim and in the crater bottom are not permitted. Also, for scientific reasons collecting of meteorites within an area extending several miles around the crater is illegal and violators are vigorously prosecuted. 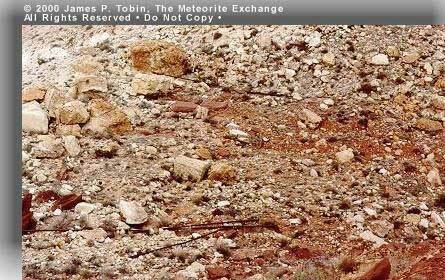 To preserve the meteorites in situ for future study no more hunting of any kind is allowed. 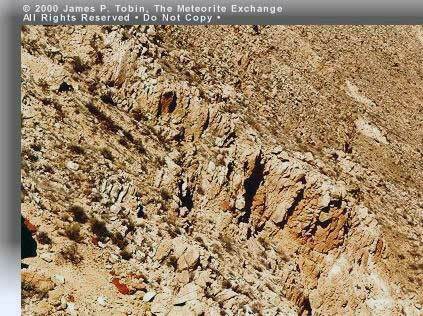 The text and photos may not be reproduced or distributed in any manner without the written permission of both The Meteorite Exchange, Inc. and Meteor Crater Enterprises, Inc. It was overcast and windy as we headed toward the crater a little before nine o-clock in the morning. The wind was a little concern if it increased in speed, but high winds are common at the crater, so we were not really worried that our hike would be canceled. Our guide, Richard, asked if there was anything special that we wanted to see. He was given a list which let him know we were prepared for the day. He said that all the sites were do-able. We chose to start on the east end of the trail. At the top of the crater rim where the telescope platform is located is the east entrance to the perimeter trail. Clearly marked with a no trespassing sign. Our guide Richard Andrews begins our journey by posing for a picture. Soon after starting we arrived at the area know as the east boulder field. One of the early features noted about the crater was its bilateral symmetry. We knew we would see the west boulder field later. Among the rocks of the east boulder field is one which shows the beginnings of a dwelling construction. On the east side of the crater in the boulder field is this rock. 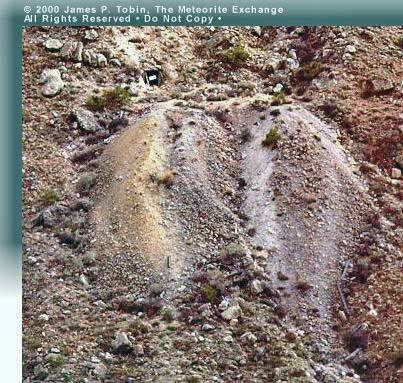 It shows the beginnings of a wall of rock on the left side of the picture. Climbing back up the slope to the rim we past House Size Rock one of the huge blocks of limestone on the rim. On the very top of the east rim is a house size boulder. It is one of many intact blocks which were thrown out of the crater during its formation. Several others fell back into the crater and rest today on the crater floor. 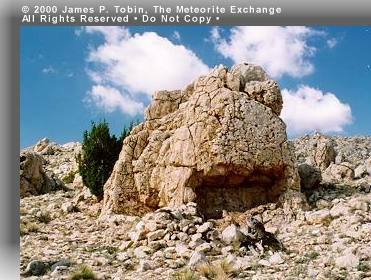 Like most, it is composed of the Kaibab limestone. From here there is a good view of the zigzag trail which was used by horses and mules to reach the bottom and is clearly seen even a hundred years later. From the very first days of work at the crater there was the need to move equipment and people in and out. There are many foot trails but the Zigzag Trail was for horses and mules. It was with pack animals at first the materials were moved down to the floor of the crater. The Zigzag Trail can be seen from the observation decks on the north rim straight across the crater on the left of the opposite side. This photo was taken near the trail from the top of the east rim near House Size Rock. At a point approximately above the zigzag trail on the rim is the remains of the mule powered winch used to move all types of materials in and presumably out of the crater. 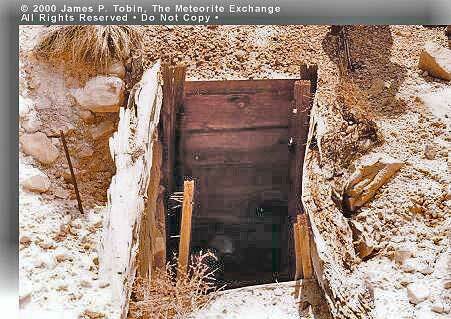 For use with it was constructed a wooden slide down the wall of the crater that the materials moved on. From this location one can look out across the south rim of the crater. There are sand dunes in this area. Like this day the wind blows strongly much of the time. On the top of the rim nearly above the Zigzag Trail are the remains of the mule powered winch which was used at a later date to move equipment and supplies down the crater wall. 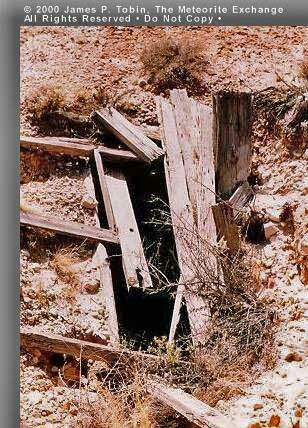 A slide of wood was built down the wall and the material were placed on it and the mule controlled the decent down into the crater. Some of the slide remains today as well. 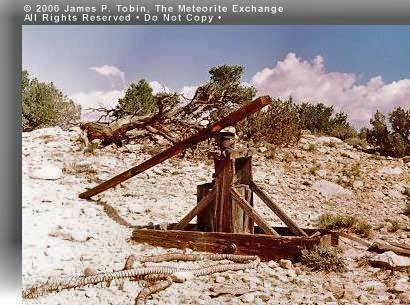 A device very similar to this winch was the horse whim used in the digging of the first shaft in the center of the crater. There the animal walked in the same kind of circle only raising and lowering the buckets of rock being dug. We move along the rim heading toward the site of the South Rim Drill Hole. 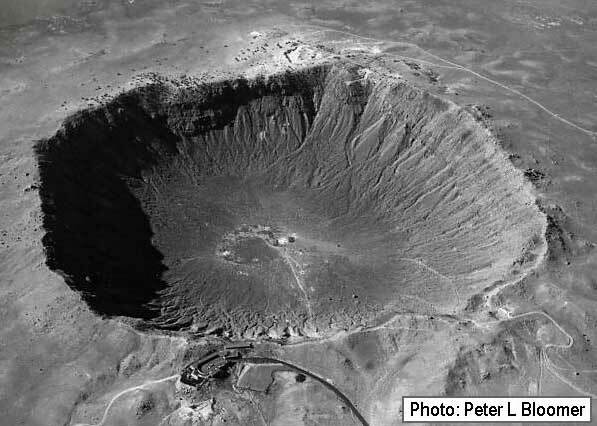 Here at 1376 feet the drill became stuck fast in what is believed to be a large piece of what remains of the asteroid which created the crater. 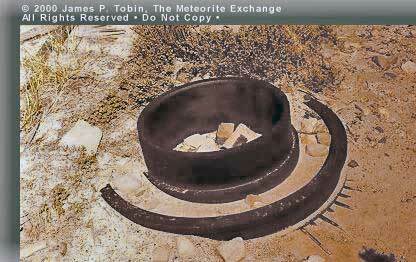 Bits like these were used in the drilling of the holes at Meteor Crater. They attached to the end of drill rod and as drilling progressed sections of additional drill rod were added. Plagued with problems from the start this drill site created another interesting location at the crater. Best seen from the north rim looking with a telescope or binoculars is the tailing pile and entrance to the horizontal tunnel. Dug into the south wall of the crater to recover lost drill tools it is now a prominent feature as one looks across the crater. When the drill tools were lost in the early stage of the drilling of the south rim hole it was decided that they could be recovered by digging a tunnel into the south wall of the crater. Barringer considered this a very dangerous operation because of the broken condition of the rocks but it was successful. The tools were recovered and the drilling continued. The photo was taken with a telephoto lens from the observation deck on the north rim. The large tailing pile is a prominent feature of the south wall today. Note the timbers scattered down the crater wall. At many locations on the walls there are timbers, they are the only remaining testimonies to the great amount of work done at the crater. 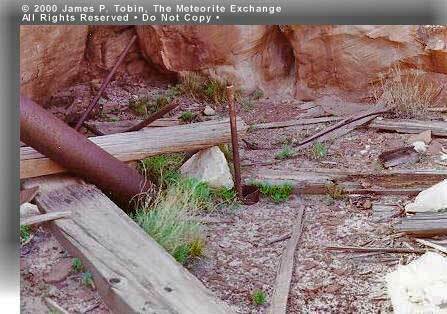 There are many timbers and pieces of half buried machinery and sections of drill rodand casing lying about the south rim site even after seventy years. 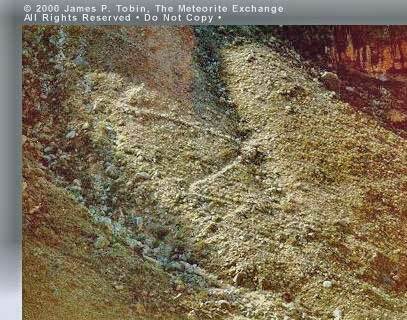 At most of the locations around the crater where work was done nature has begun to cover and erase the evidence. Here is pictured the top of what looks like the bull wheel of the drilling equipment of the south rim hole. Next to it is a small piece of the belt still present after seventy years. From this point on the crater rim it is a good location to see the vertically tilted rocks of the south cliffs. The layers of rock all around the crater rim have been uplifted and tilted, however at the south cliffs the rock are vertical. It has been suggested that the force exerted on the south cliffs was greater because the distance to the focus of the explosion was shorter. 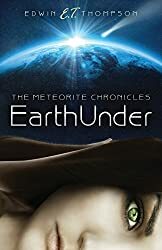 If the body of the asteroid came to a stop and released its kinetic energy under the south cliffs they would be closest to the focus. 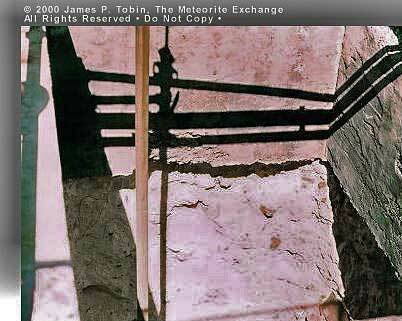 Barringer was convinced that the remaining body of metal was under the south rim. The drill on the south rim hit something meteoric. The rocks of the south cliffs and rim are also displaced much more than the rest of the rim. We leave the very top and edge of the crater rim and head down the slope out toward the plain. After the drill hole on the south rim it was thought that they had finally discovered the location of the buried iron they sought to mine. Our next stop was the site of the great shaftwhich was to be used in removing that iron. It was dug in the slope about 1500 ft from the rim edge and was clearly an enormous effort. At the end of the 1920’s the activity at the crater had moved out onto the south slope. About 1500 feet from the south rim hole was where it was decided that a great shaft would be dug to remove the iron ore they believed they had found. They made astounding progress at first. In fact they dug to 500 ft in just a few weeks. Soon the problem of water flooding the shaft would occur again as it had in the shafts dug in the crater floor and they would be forced to abandon the effort. 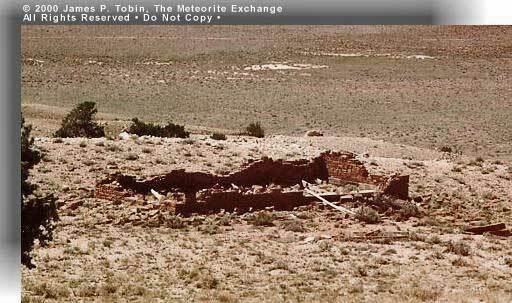 This would be the last big attempt to dig to the buried mass of the meteorite. The nature of the cratering process was becoming understood and it was becoming clear that most of the mass vaporizes on impact. Little would be found buried under the crater. The huge tailing pile from this shaft is clearly visible in aerial shots of the crater as are the large concrete foundations for the equipment. These are the concrete slabs of the Last Shaft on the crater’s south slope. The machinery would have been bolted down to the bolts which remain visible today. Nothing of any buildings remain at this location except the slabs. Around the area are many other small shafts and diggings. This shaft like others was flooded by groundwater. At many locations around the crater there is evidence of diggings. Many were filled long ago some like these pictures are shafts which have remained. Often before a major project was undertaken test shafts were dug in the area. They are near the Last Shaft and may have been two of the test shafts for that undertaking. Looking toward the rim from here you can see the next location we were interested in visiting. For a brief period about fifty years ago the silica of the crater was mined for glass making. Two buildings remain in good condition today. At the Silica Mine which was in operation in the 1940’s, two buildings remain in quite good condition. The one in the foreground is the workers quarters and the one in the background is the building where the bags for holding the silica were kept. It has been aptly named the “baghouse”. A curious feature of the construction is the number of nails used by the builders. Inside the buildings are nails everywhere on the ground. It is perhaps this great quantity of nails which has helped to hold these buildings together despite the high winds common at the crater. In all only several hundred tons of silica were taken away. Bags for the silica are still piled in the bag housewaiting silently for the workers to return and fill them. 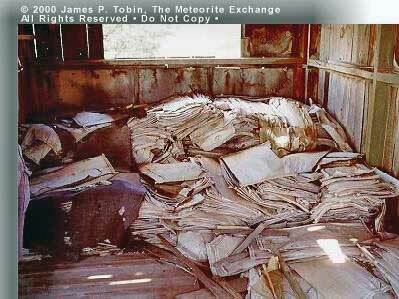 Still piled in the Bag house after fifty years are the bags which were filled with the pure silica from the silica pits. The bags are in good shape and would work still today. There did not seem to have been any printing on the bags. The great white silica pits apparently unable to support growth now that the top soil is gone remain unchanged from the day those workers left. This is one of the silica pits where the mineral was dug out. Several hundred tons were removed in all. It was sent to Los Angeles for glass making. The white scars of this operation are clearly visible on any aerial photo taken since the mining. Moving on around the south rim toward the west we hike past the remains of another building which was in it’s early stages of construction when abandoned. This was to be the school for the children of the workers at the crater. There were not just the men working in the silica mine living at the crater. There were also their families. There was a time when it was thought that the children needed a school. A short distance around the rim from the silica mine are these ruins. The schoolhouse never got very far in its construction. The silica mining operation did not last for very long. Like most of the buildings in the region built in those days it was being made from the native Moenkopi sandstone and has that distinctive deep reddish brown color. 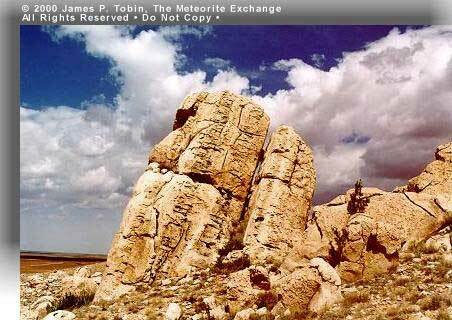 Soon our hike brings us to the west boulder field, here we find another of the famous rocks. Whale Rockwith its weathered split now resembles the head of a sperm whale rising above the water. In the east boulder field is another of the huge blocks of rock thrown from the crater. Named Whale Rock early on it has stuck till today. Looking very much like the head of a great whale breaking the water it rests a short distance from the crater rim on the slope. Hiking on brings us to the highest point on the rim of the crater. Named for D. M. Barringer, Barringer Point is a superb location to look at the crater and the surrounding territory. 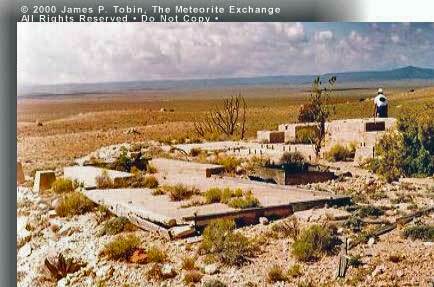 The highest point on the rim of Meteor Crater is Barringer Point. 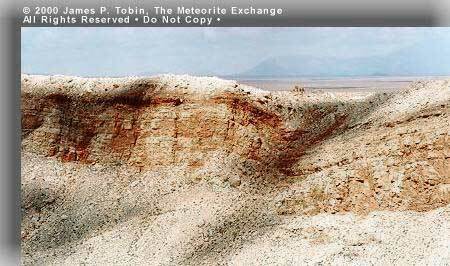 It is on the west side of the crater and rises about 127 feet above the level of the flat plain surrounding the crater. There is a great view from here of the land to the west. Canyon Diablo can be seen meandering across the terrain as a green line. From here the pole on the north west slope of the crater which marks the original corner of one of the claims can be seen. Canyon Diablo can be seen meandering out to the west. It was there that the water for the work at the crater was obtained. Both water and oil were pumped to tanks on the rim and in the crater bottom. They were used by steam powered equipment. From the north west corner of the crater one can still see long sections of the pipelines. On the crater rim as early as 1909 when pictures were published of them there were pipelines to bring both water and oil to the crater. There were also tanks both on the rim and in the floor of the crater to hold the water and oil. One of the tanks for water had a volume of 54,000 gallons. As the picture shows long sections of the pipe remain today as rusting reminders of the work done ninety years ago. The pipe was made in a rolled and riveted form and is lighter than pipe used today. A short piece is there for guests to view. The pipe for the water and oil used at the crater is obviously not like pipe made today. It is a rolled and riveted tube which is lighter than the pipe we are used to. Nearing the end now, the last historic sites on the rim are located where the original museum was located. This like most of the older building in the region was constructed of the native Moenkopi sandstone and is red in color. 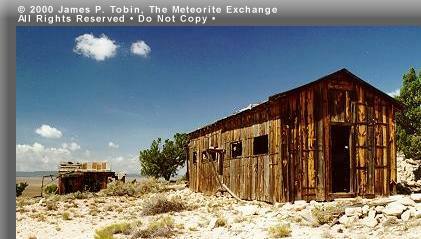 Originally housed here was the Holsinger fragmentthe largest iron meteorite found at the crater. 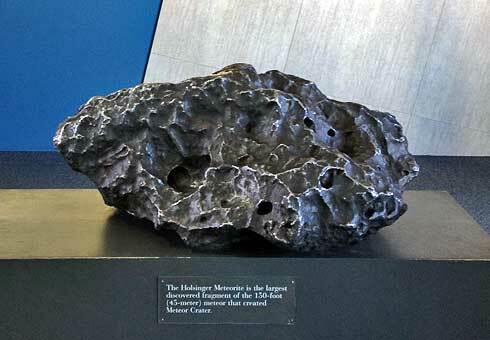 Weighting in at over 1,400 pounds the Holsinger Fragment is the largest of the meteorites found at Meteor Crater. 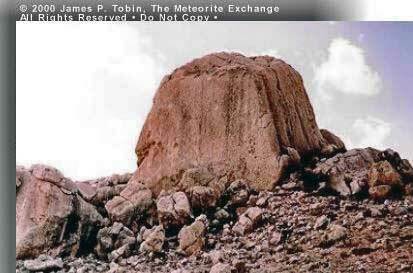 Named for Samuel Holsinger who had been Barringer Forman and drill supervisor for many years it now rests in the museum on the crater rim. 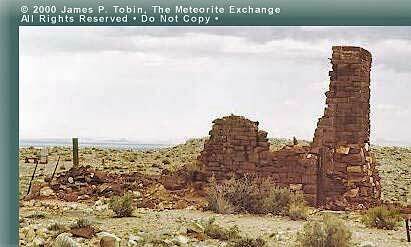 Like many of the Canyon Diablo meteorites it has holes in it. Some of these hole were probably where graphite nodules burned away. 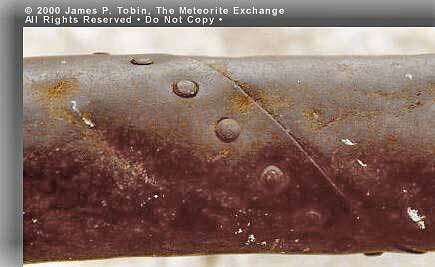 Nodules of graphite are very common is Canyon Diablo meteorites. As we make our way toward the end of the trail and the present museum building we pass a collection of fossils found in the Kaibab limestone the yellow and orange rocks. The Kaibab limestone at the crater contains a variety of fossils. 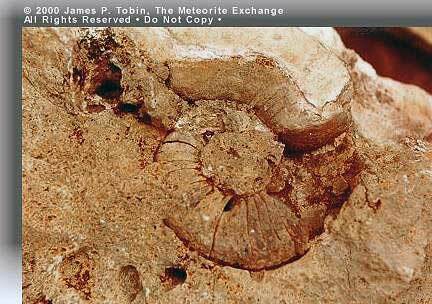 Seen here is an ammonite of quite large size. Shells and other fossils are found as well. The Kaibab is under the red Moenkopi sandstone and above the gray Coconino sandstone. 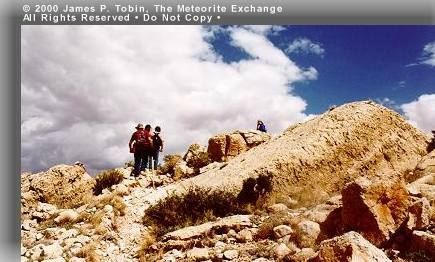 There are only three different rocks represented at Meteor Crater. Just under the topsoil is the dark reddish brown Moenkopi sandstone. Below the Moenkopi are the yellow and orange layers of the Kaibab limestone. For several hundred feet below the Kaibab limestone there is only the Coconino sandstone. It is this grayish rock which is seen making up most of the crater walls. 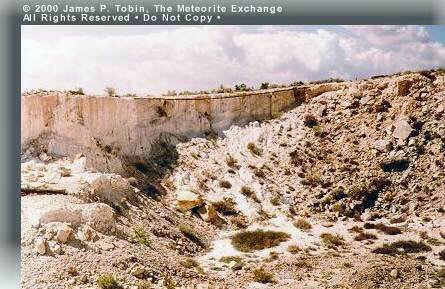 It is the pulverized Coconino which is white that was dug up in the first shafts. Piles of this white silica are very obvious on the crater floor still today. We were ready to sit down and have something cool to drink at the snack bar, but we could not leave till we had visited the museumand taken a good look at the displays and specimens. Pictured from left to right are Paul Harris, Alan Gayda, Jim Tobin and Cindy Gayda. Paul and Jim would like to express their thanks to Alan and Cindy for the use of some of their pictures. 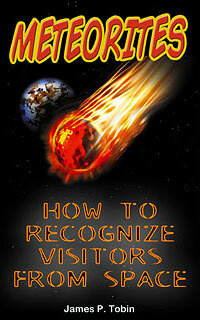 Meteor Crater is located between Flagstaff and Winslow, in central Arizona, a five minute drive from Interstate 40. Meteor Crater Enterprises, Inc. operates a RV park with a gas station at the exit to the interstate.